Twenty-one years ago last September, on a lonely stretch of railroad track paralleling U.S. Highway 101 near Salinas, 32 Bracero farm workers lost their lives in a tragic accident. The Braceros had been imported from Mexico to work on California farms. They died when their bus, which was converted from a flatbed truck, drove in front of a freight train. Conversion of the bus had not been approved by any government agency. The driver had “tunnel” vision. Most of the bodies lay unidentified for days. No one, including the grower who employed the workers, even knew their names. Today, thousands of farm workers live under savage conditions–beneath trees and amid garbage and human excrement–near tomatoe fields in San Diego County, tomatoe fields which use the most modern farm technology. Vicious rats gnaw on them as they sleep. They walk miles to buy food at inflated prices. And they carry in water from irrigation pumps. Child labor is still common in many farm areas. As much as 30 percent of Northern California’s garlic harvesters are under-aged children. Kids as young as six years old have voted in state-conducted union elections since they qualified as workers. Some 800,000 under-aged children work with their families harvesting crops across America. Babies born to migrant workers suffer 25 percent higher infant mortality than the rest of the population. Malnutrition among migrant worker children is 10 times higher than the national rate. Farm workers’ average life expectancy is still 49 years –compared to 73 years for the average American. All my life, I have been driven by one dream, one goal, one vision: To overthrow a farm labor system in this nation which treats farm workers as if they were not important human beings. Farm workers are not agricultural implements. They are not beasts of burden–to be used and discarded. That dream was born in my youth. It was nurtured in my early days of organizing. It has flourished. It has been attacked. I’m not very different from anyone else who has ever tried to accomplish something with his life. My motivation comes from my personal life–from watching what my mother and father went through when I was growing up; from what we experienced as migrant farm workers in California. That dream, that vision, grew from my own experience with racism, with hope, with the desire to be treated fairly and to see my people treated as human beings and not as chattel. It grew from anger and rage–emotions I felt 40 years ago when people of my color were denied the right to see a movie or eat at a restuarant in many parts of California. It grew from the frustration and humiliation I felt as a boy who couldn’t understand how the growers could abuse and exploit farm workers when there were so many of us and so few of them. Later, in the ’50s, I experienced a different kind of exploitation. In San Jose, in Los Angeles and in other urban communities, we–the Mexican American people–were dominated by a majority that was Anglo. I began to realize what other minority people had discovered: That the only answer–the only hope–was in organizing. More of us had to become citizens. We had to register to vote. And people like me had to develop the skills it would take to organize, to educate, to help empower the Chicano people. I spent many years–before we founded the union–learning how to work with people. We experienced some successes in voter registration, in politics, in battling racial discrimination–successes in an era when Black Americans were just beginning to assert their civil rights and when political awareness among Hispanics was almost non-existent. But deep in my heart, I knew I could never be happy unless I tried organizing the farm workers. I didn’t know if I would succeed. But I had to try. All Hispanics–urban and rural, young and old–are connected to the farm workers’ experience. We had all lived through the fields–or our parents had. We shared that common humiliation. How could we progress as a people, even if we lived in the cities, while the farm workers–men and women of our color–were condemned to a life without pride? How could we progress as a people while the farm workers–who symbolized our history in this land–were denied self-respect? How could our people believe that their children could become lawyers and doctors and judges and business people while this shame, this injustice was permitted to continue? They’re half right. The United Farm Workers is first and foremost a union. A union like any other. A union that either produces for its members on the bread and butter issues or doesn’t survive. But the UFW has always been something more than a union –although it’s never been dangerous if you believe in the Bill of Rights. The UFW was the beginning! We attacked that historical source of shame and infamy that our people in this country lived with. We attacked that injustice, not by complaining; not by seeking hand-outs; not by becoming soldiers in the War on Poverty. Farm workers acknowledged we had allowed ourselves to become victims in a democratic society–a society where majority rule and collective bargaining are supposed to be more than academic theories or political rhetoric. And by addressing this historical problem, we created confidence and pride and hope in an entire people’s ability to create the future. 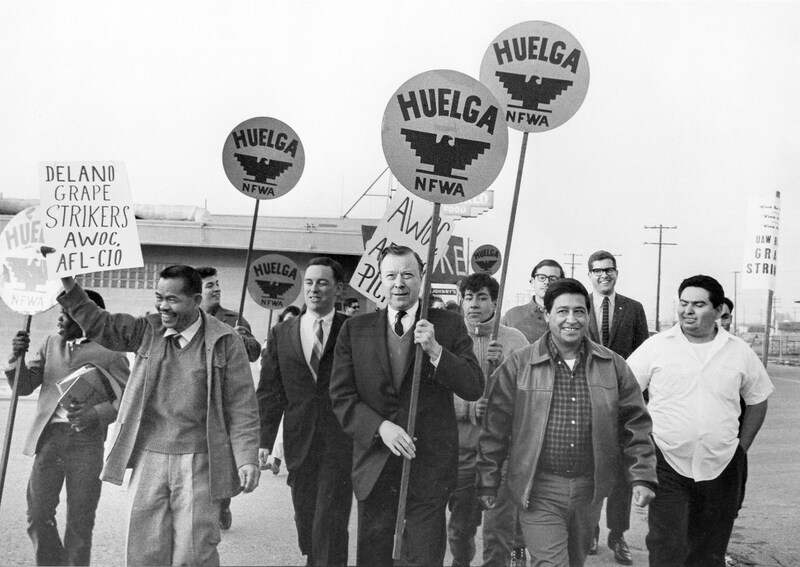 The UFW’s survival–its existence-was not in doubt in my mind when the time began to come–after the union became visible–when Chicanos started entering college in greater numbers, when Hispanics began running for public office in greater numbers–when our people started asserting their rights on a broad range of issues and in many communities across the country. The union’s survival–its very existence–sent out a signal to all Hispanics that we were fighting for our dignity, that we were challenging and overcoming injustice, that we were empowering the least educated among us–the poorest among us. The message was clear: If it could happen in the fields, it could happen anywhere– in the cities, in the courts, in the city councils, in the state legislatures. I didn’t really appreciate it at the time, but the coming of our union signaled the start of great changes among Hispanics that are only now beginning to be seen. I’ve travelled to every part of this nation. I have met and spoken with thousands of Hispanics from every walk of life–from every social and economic class. One thing I hear most often from Hispanics, regardless of age or position–and from many non-Hispanics as well–is that the farm workers gave them hope that they could succeed and the inspiration to work for change. From time to time you will hear our opponents declare that the union is weak, that the union has no support, that the union has not grown fast enough. Our obituary has been written many times. How ironic it is that the same forces which argue so passionately that the union is not influential are the same forces that continue to fight us so hard. The union’s power in agriculture has nothing to do with the number of farm workers under union contract. It has nothing to do with the farm workers’ ability to contribute to Democratic politicians. It doesn’t even have much to do with our ability to conduct successful boycotts. The very fact of our existence forces an entire industry –unionized and non-unionized–to spend millions of dollars year after year on improved wages, on improved working conditions, on benefits for workers. If we’re so weak and unsuccessful, why do the growers continue to fight us with such passion? Because so long as we continue to exist, farm workers will benefit from our existence–even if they don’t work under union contract. It doesn’t really matter whether we have 100,000 members or 500,000 members. In truth, hundreds of thousands of farm workers in Calfiornia–and in other states–are better off today because of our work. And Hispanics across California and the nation who don’t work in agriculture are better off today because of what the farm workers taught people about organization, about pride and strength, about seizing control over their own lives. Tens of thousands of the children and grandchildren of farm workers and the children and grandchildren of poor Hispanics are moving out of the fields and out of the barrios–and into the professions and into business and into politics. And that movement cannot be reversed! Our union will forever exist as an empowering force among Chicanos in the Southwest. And that means our power and our influence will grow and not diminish. Two major trends give us hope and encouragement. First, our union has returned to a tried and tested weapon in the farm workers’ non-violent arsenal–the boycott! After the Agricultural Labor Relations Act became law in California in 1975, we dismantled our boycott to work with the law. During the early- and mid-’70s, millions of Americans supported our boycotts. After 1975, we redirected our efforts from the boycott to organizing and winning elections under the law. The law helped farm workers make progress in overcoming poverty and injustice. At companies where farm workers are protected by union contracts, we have made progress in overcoming child labor, in overcoming miserable wages and working conditions, in overcoming sexual harassment of women workers, in overcoming dangerous pesticides which poison our people and poison the food we all eat. Where we have organized, these injustices soon pass into history. But under Republican Governor George Deukmejian, the law that guarantees our right to organize no longer protects farm workers. It doesn’t work anymore. In 1982, corporate growers gave Deukmejian one million dollars to run for governor of California. Since he took office, Deukmejian has paid back his debt to the growers with the blood and sweat of California farm workers. Instead of enforcing the law as it was written against those who break it, Deukmejian invites growers who break the law to seek relief from the governor’s appointees. What does all this mean for farm workers? It means that the right to vote in free elections is a sham. It means that the right to talk freely about the union among your fellow workers on the job is a cruel hoax. It means the right to be free from threats and intimidation by growers is an empty promise. It means the right to sit down and negotiate with your employer as equals across the bargaining table–and not as peons in the field — is a fraud. It means that thousands of farm workers–who are owed millions of dollars in back pay because their employers broke the law–are still waiting for their checks. It means that 36,000 farm workers–who voted to be represented by the United Farm Workers in free elections–are still waiting for contracts from growers who refuse to bargain in good faith. It means that, for farm workers, child labor will continue. It means that infant mortality will continue. It means malnutrition among our children will continue. It means the short life expectancy and the inhuman living and working conditions will continue. Are these make-believe threats? Are they exaggerations? Ask the farm workers who are still waiting for growers to bargain in good faith and sign contracts. Ask the farm workers who’ve been fired from their jobs because they spoke out for the union. Ask the farm workers who’ve been threatened with physical violence because they support the UFW. Ask the family of Rene Lopez, the young farm worker from Fresno who was shot to death last year because he supported the union. These tragic events forced farm workers to declare a new international boycott of California table grapes. That’s why we are asking Americans once again to join the farm workers by boycotting California grapes. The Louis Harris poll revealed that 17 million American adults boycotted grapes. We are convinced that those people and that good will have not disappeared. That segment of the population which makes our boycotts work are the Hispanics, the Blacks, the other minorities and our allies in labor and the church. But it is also an entire generation of young Americans who matured politically and socially in the 1960s and ’70s–millions of people for whom boycotting grapes and other products became a socially accepted pattern of behavior. If you were young, Anglo and on or near campus during the late ’60s and early ’70s, chances are you supported farm workers. Fifteen years later, the men and women of that generation of are alive and well. They are in their mid-30s and ’40s. They are pursuing professional careers. Their disposable income is relatively high. But they are still inclined to respond to an appeal from farm workers. The union’s mission still has meaning for them. Only today we must translate the importance of a union for farm workers into the language of the 1980s. Instead of talking about the right to organize, we must talk about protection against sexual harasasment in the fields. We must speak about the right to quality food–and food that is safe to eat. I can tell you that the new language is working; the 17 million are still there. They are resonding–not to picketlines and leafletting alone, but to the high-tech boycott of today–a boycott that uses computers and direct mail and advertising techniques which have revolutionized business and politics in recent years. We have achieved more success with the boycott in the first 11 months of 1984 that we achieved in the 14 years since 1970. The other trend that gives us hope is the monumental growth of Hispanic influence in this country and what that means in increased population, increased social and economic clout, and increased political influence. South of the Sacramento River in California, Hispanics now make up more than 25 percent of the population. That figure will top 30 percent by the year 2000. There are 1.1 million Spanish-surnamed registered voters in California; 85 percent are Democrats; only 13 percent are Republicans. In 1975, there were 200 Hispanic elected officials at all levels of government. In 1984, there are over 400 elected judges, city council members, mayors and legislators. In light of these trends, it is absurd to believe or suggest that we are going to go back in time–as a union or as a people! The growers often try to blame the union for their problems–to lay their sins off on us–sins for which they only have themselves to blame. The growers only have themselves to blame as they begin to reap the harvest from decades of environmental damage they have brought upon the land–the pesticides, the herbicides, the soil fumigants, the fertilizers, the salt deposits from thoughtless irrigation–the ravages from years of unrestrained poisoning of our soil and water. Thousands of acres of land in California have already been irrevocably damaged by this wanton abuse of nature. Thousands more will be lost unless growers understand that dumping more poisons on the soil won’t solve their problems–on the short term or the long term. Health authorities in many San Joaquin Valley towns already warn young children and pregnant women not to drink the water because of nitrates from fertilizers which have contaminated the groundwater. The growers only have themselves to blame for an increasing demand by consumers for higher quality food–food that isn’t tainted by toxics; food that doesn’t result from plant mutations or chemicals which produce red, lucious-looking tomatoes–that taste like alfalfa. The growers are making the same mistake American automakers made in the ’60s and ’70s when they refused to produce small economical cars–and opened the door to increased foreign competition. Growers only have themselves to blame for increasing attacks on their publicly-financed hand-outs and government welfare: Water subsidies; mechanization research; huge subsidies for not growing crops. These special privileges came into being before the Supreme Court’s one-person, one-vote decision–at a time when rural lawmakers dominated the Legislature and the Congress. Soon, those hand-outs could be in jeopardy as government searches for more revenue and as urban taxpayers take a closer look at farm programs–and who they really benefit. The growers only have themselves to blame for the humiliation they have brought upon succeeding waves of immigrant groups which have sweated and sacrificed for 100 years to make this industry rich. For generations, they have subjugated entire races of dark-skinned farm workers. These are the sins of the growers, not the farm workers. We didn’t poison the land. We didn’t open the door to imported produce. We didn’t covet billions of dollars in government hand-outs. We didn’t abuse and exploit the people who work the land. Today, the growers are like a punch-drunk old boxer who doesn’t know he’s past his prime. The times are changing. The political and social environment has changed. The chickens are coming home to roost–and the time to account for past sins is approaching. I am told, these days, why farm workers should be discouraged and pessimistic: The Republicans control the governor’s office and the White House. They say there is a conservative trend in the nation. Yet we are filled with hope and encouragement. We have looked into the future and the future is ours! History and inevitability are on our side. The farm workers and their children–and the Hispanics and their children–are the future in California. And corporate growers are the past! Those politicians who ally themselves with the corporate growers and against the farm workervs and the Hispanics are in for a big surprise. They want to make their careers in politics. They want to hold power 20 and 30 years from now. But 20 and 30 years from now–in Modesto, in Salinas, in Fresno, in Bakersfield, in the Imperial Valley, and in many of the great cities of California–those communities will be dominated by farm workers and not by growers, by the children and randchildren of farm workers and not by the children and grandchildren of growers. These trends are part of the forces of history that cannot be stopped. No person and no organization can resist them for very long. They are inevitable. You cannot uneducate the person who has learned to read. You cannot humiliate the person who feels pride. You cannot oppress the people who are not afraid anymore. Our opponents must understand that it’s not just a union we have built. Unions, like other institutions, can come and go. But we’re more than an institution. For nearly 20 years, our union has been on the cutting edge of a people’s cause–and you cannot do away with an entire people; you cannot stamp out a people’s cause. Regardless of what the future holds for the union, regardless of what the future holds for farm workers, our accomplishments cannot be undone. “La Causa”–our cause–doesn’t have to be experienced twice. The consciousness and pride that were raised by our union are alive and thriving inside millions of young Hispanics who will never work on a farm! Like the other immigrant groups, the day will come when we win the economic and political rewards which are in keeping with our numbers in society. The day will come when the politicians do the right thing by our people out of political necessity and not out of charity or idealism. That day may not come this year. That day may not come during this decade. But it will come, someday! And on that day, our nation shall fulfill its creed–and that fulfillment shall enrich us all.